Oh, c''mon! Don't you remember what happened to Smart Alec when he looked inside of Shaman's pouch? Making a joke myself, already looked into the pouch and all that. Never mind, move on. As I mentioned previously, altho I am addicted to these lead figures, I think I will most likely pass on Galactus. I have the HeroClix edition, and that one is almost perfectly scaled to these figures. as you can see in the picture I posted on the previous page. Whoa. Alliteration way too early in the morning! I just found a shop who have those Marvel Lead statues. Already bought She-Hulk. I will try to have Doctor Strange. This whole area is new to me but I really like a lot of the pieces pictured in this thread. Do you guys buy directly from Bowen Designs or are there other places to buy figurines? Is there an online store that carries all the statues and figures from different companies or is Bowen the only one worth looking at? I remember seeing years ago MacFarlane statues at a comic book store. Are they worth looking into? Hmmm, I just noticed that Bowen Designs does not ship outside of the United States. Another company that ignores 98% of the world. Sigh. I realise they blame Marvel for this policy but that crushed my hopes of actually buying a piece from them. Off to eBay, I guess. You might give Best Comics in New York a shot. They carry Bowen products and the name on their website suggests that they ship internationally. I've purchased from them and found them to prompt with shipping and courteous in correspondences. Thanks. I will look at their services. Got these on eBay -- a line I wish BOWEN had continued. I have the Zorro, too, but I think Zorro, Flash and Ming are all he made from "the classics"
I'd love to have a Buck Rogers, Tarzan, Lone Ranger, Tonto, etc. I've never seen those before, pretty cool. Love the Maddox goodness in the background, too. 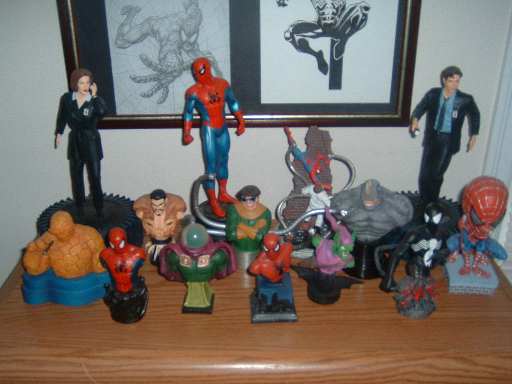 Only missing a Hellboy bust made by a Sculptor names John Thompson..otherwise, this is my complete Bowen Goodness. The action figures have been hidden away. -- and that is a Ron Frenz commission in the back? Bottom of a Frenz on the right, Isherwood on the left..
Bowen are setting up an auction service " to help you, the true collector, to complete your Bowen Collection of Sold-Out and hard to find busts, statues, and model kits. Be forewarned that this is called Rocky's Vault and not Rocky's Bargain Basement, for a reason. It's called Rocky's Vault because these are rare, top notch, top dollar, and inspected pieces. You may be asking: Where do these pieces come from? In most instances, they were purchased long ago by us (Rocky and Randy) personally from our corporation: Bowen Designs, Inc. and they are our personal property. Items will be made available on a first come, first serve basis. " the busts the second time around.